My little paws were itching for something new and exciting this week, so I decided to check off another restaurant in my long list. I am so glad I did, Olio is fantastic. The wine bar is in an old refurbished gas station just a few blocks from The Grove. They have done a remarkable job in reclaiming this space. The antiques have an odd but perfect modern feel to it. Oh, and the music comes from an old phonograph they have sitting on the bar. How cool is that? The old service bay of the station serves as one dining area that may fit 15 people. The other side of the station is a bar area with another 15 to 20 stools near the window. It’s tiny, and wonderfully quaint. Now on to the menu. It’s advertised and touted as a wine bar, and they do have an amazing selection. If you are not up on your wines, you may feel a bit overwhelmed at what you have to choose from, but don’t worry the folks at Olio will make you feel right at home and will answer any questions you have. The chef and one of the owners actually came out to chat for a bit. Something you just don’t get these days. It’s all about the service and atmosphere here at Olio. The small plates are what I’m actually wanting to talk about. The food is phenomenal and I mean that. Many of my followers can attest that I am one to speak my mind even if it’s bad. 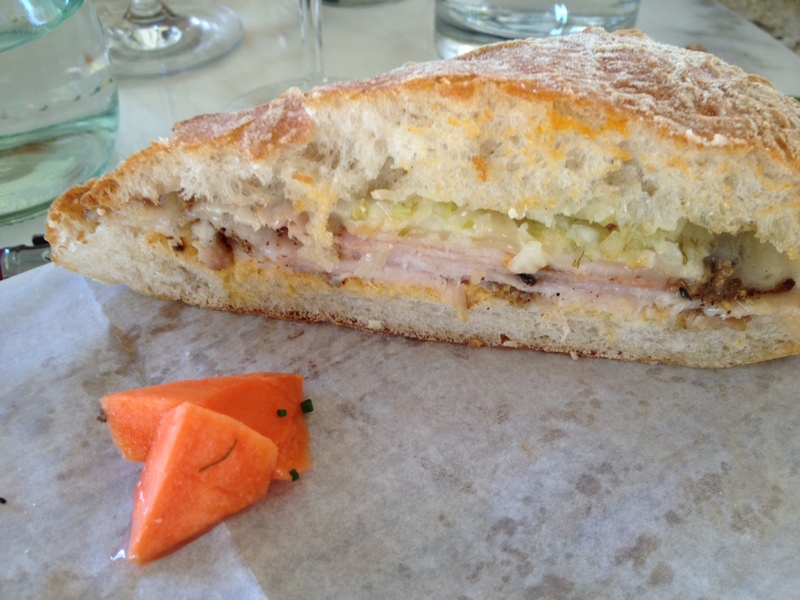 I had the off the menu, porchetta sandwich. First of all the bread was amazing, probably some of the best I’ve had since moving to St. Louis. The pork was flavorful without being greasy or fatty. The mustard, and pickle slaw blended perfectly with the cheese. This was not just a sandwich, every flavor was perfectly balanced. I know I’m getting to excited about a sandwich, but really it’s that good. I also ordered the soup of the day which was a potato and parsnip puree. I have never had a soup so creamy, smooth and velvety. It was drizzled with a sharp, grassy olive oil, a dollop of sour cream and a sprinkling of chives. This little dog was in heaven! If you have not been to Olio, you are missing out on one of the best little spots this town has to offer. If you’ve been there, you know what I’m talking about. Now if spring will only get here as they have a fabulous outdoor patio that is just waiting to be filled with hipsters, laughter and lots of great food and wine.